Due to technological advancements, today’s hearing aids do an excellent job of helping people meet many of their communication needs. However, sometimes there are situations where additional technologies may be needed to further improve hearing. Some hearing aid users may continue to experience difficulty understanding speech in noisy environments, when watching TV or attending a movie or play, or while listening on the telephone. At bedtime, a person with even a mild to moderate hearing loss may not hear the smoke alarm located down the hall. This same person might miss a doorbell chime while listening to the TV. Alerting devices can be purchased individually to warn a person of a specific event or as complete systems that warn a person of a variety of events. For example, someone living in a one-room apartment might need just a simple device that flashes a light when someone presses the doorbell or knocks on the door, whereas another individual living in a large house with many rooms may need a system that triggers flashing lamps in every room of the house when the doorbell is pressed, the telephone rings, or the fire alarm is activated. Alerting devices sometimes use a combination of signals. For example, a smoke or carbon monoxide alarm might simultaneously trigger flashing lights throughout the home, a loud horn and a vibrating device or fan. The ability to hear a telephone ring will depend on a number of factors such as the severity of the hearing loss, the frequency of the telephone ring and the distance from the telephone to the person. There are a few different types of telephone amplifiers to attach to a regular telephone as well as a wide variety of available amplified telephones. Many cell phones will note that they are hearing aid compatible. In addition, most cell phones can be used with a cell phone amplifier as well as have a text message option. For those who cannot clearly communicate via telephone, even with amplification, there are other options such as the “voice carry over” (VCO) or “read and talk” telephone. Used with the telephone relay service, VCO allows you to talk directly to the other party while an operator translates what the other party says to you into print that is displayed on a small LCD screen. For many individuals, the frustration associated with watching television may simply be one of distance. As one listens to a TV from a distance, not only does the sound signal become weaker as it travels from the television to the ears, but the acoustical characteristics of the room make the sound less distinct. Simply sitting closer to the TV may be enough to improve hearing. Some TVs also come with jacks into which an earphone or a transmitter can be plugged. There are many other options including various wireless transmitters and receivers. Below are just a few examples of places to purchase hearing loss support devices. 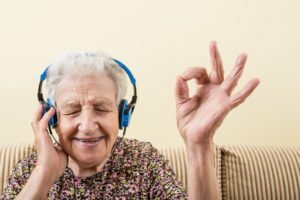 Along with providing the stress-free companionship of someone who understands hearing loss, Hired Hands Homecare of California can help older adults to remain independent and stay safe within their home and daily environment. Call us any time at (866) 940-4343 for more information or to set up a free in-home consultation.